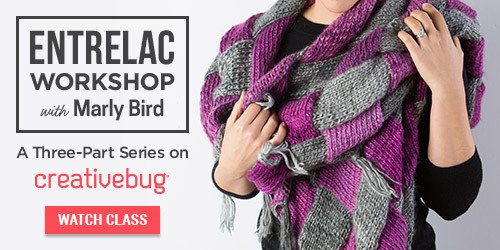 This week’s pattern is the Great Falls Poncho. This is a sister knit project to the Mountain Mist Poncho. Just like with the Mountain Mist Poncho this is designed as large rectangle that you hold together with buttons. There is no shaping in the project, the difficulty of this project is in working the cables and lace. As we move into spring weather you will love this as a quick piece to throw on on cool nights. When selecting your yarn for this project you will want to pick something that will make the cable stitches pop. A yarn with wool will help to make the stitches stand out. Take a look at some of my suggestions below for other yarn suggestions. I want a poncho knitted topdown in the round (no sewing).